The classic orange phaser – MXR Phase 90 – only has one control knob for speed. It’s seen as the easiest phaser to use as you just need to set the speed and you’re done. But only having control over speed means you miss out on controlling any other aspect of the effect. The Blood Moon Phaser gives you three knobs to control the effect. The rate knob adjusts the speed of the phaser sweep, the depth knob controls the intensity or how pronounced the phaser is, and the feedback knob allows you to feed some of the output back through the circuit again. It’s not very common to see a three knob phaser pedal and it’s a refreshing sight. While I understand why some guitarists might like the simplicity of only controlling a phaser’s speed, they’re missing out on tweaking the perfect phaser sound for different needs. When it comes to ease of use, the Blood Moon Phaser does a fantastic job. It’s far simpler than the Helix Phaser (also by TC Electronic), but still offers a lot of flexibility for such a budget pedal. 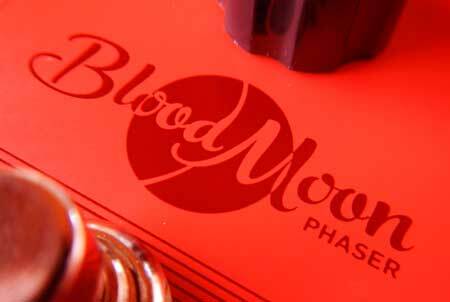 The Blood Moon Phaser was the first pedal out of the Smorgasbord of Tones range that blew me away with what I heard. For such a low cost pedal, it offers a fantastic quality effect with very nice depth. The reason why the Blood Moon Phaser sounds so good is that it’s not a one-trick pony. The MXR Phase 90 – which is a great pedal – only gives you one sound with control over speed. You can’t change the intensity of the effect and you can’t feed the effect back on itself like you can with the Blood Moon Phaser. It might not seem like much, but this extra control makes a phaser so much more useful. In the above video, you can hear how adjusting each knob produces a significantly different effect. From a subtle slow-moving filter, to a warbling soupy mess, you can a lot of control over what type of phaser you want to use. Cranking up the feedback knob produced a nice resonance that is completely missing from other phasers. Feedback control is usually only seen on higher range phaser pedals, so it’s great to see it on the Blood Moon Phaser. The rate knob is non-linear which means the last 20% of the knob’s range covers a big range in speed. Cranking it all the way created a rapidly pulsing effect that some other phasers lack. The only negative thing I noticed with the Blood Moon Phaser is that the volume did seem to jump up when the pedal was enabled. This depended on the pedal position as I noticed when the phaser was placed after other pedals such as a compressor, I didn’t notice much of a difference in volume. The Blood Moon Phaser is built with a rugged two-piece housing design as shown to the right. 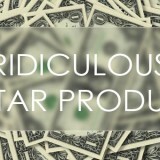 All of the Smorgasbord of Tones pedals are made with the exact same housing which helps them cut down the cost. While it’s a budget pedal, it definitely doesn’t feel like it. It’s solid and well designed. The control knobs are firm and have a really nice feel as you move them. 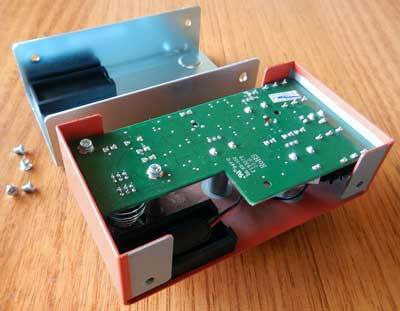 You can power the Blood Moon Phaser with a 9V battery or use an external PSU. The top of the pedal states 9V DC 100mA, but the pedal actually only draws 18mA. 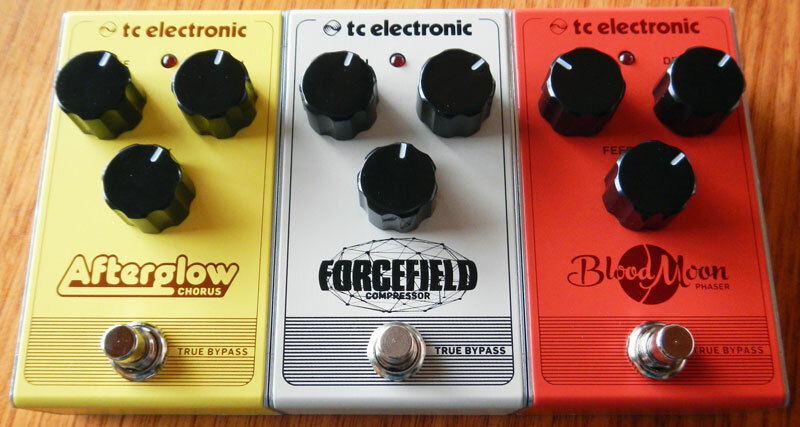 As I explained in my review of the Forcefield Compressor – which is also part of the Smorgasbord of Tones range – I really like the top mounted I/O across the range. The square sides and the top mounted I/O allow you to line the pedals up to save space. You can see below that they fit snug together. It’s great to see such a low-cost range of pedals with a well thought out design and quality. I really enjoy using the Blood Moon Phaser and in many ways it’s better than the more popular phasers available. Having three knobs to control the effect gives you far more control than other phasers that only have one knob or a knob and a switch. Phasers can be used in many different situations so being able to tweak and control the effect is important. The Blood Moon Phaser feels like a much higher quality pedal than the price tag suggests. This would be a great pedal for a beginner getting started or even a more experienced player wanting to experiment with adding phaser to the mix. Who is the Blood Moon Phaser for? Most guitarists will likely only use a phaser on occasion. 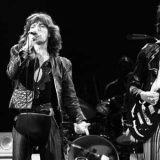 Maybe in certain songs where you want to add something fresh to the tone. 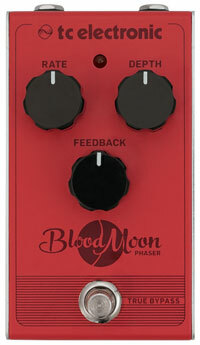 The Blood Moon Phaser is ideal for those situations as it provides a great tone with plenty of control. As it’s a very low-cost pedal, it’s a good way to experiment with using a phaser. You can get a lot of inspiration out of this pedal and it won’t cost anywhere as much as other more popular phasers. Who isn’t the Blood Moon Phaser for? While the Blood Moon Phaser does offer good control over the effect, if you need more control or want a phaser with more stages, there are other options that may suit you better. 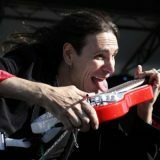 When you ask people what phaser to get, a lot of people will suggest the MXR Phase 90 or the Van Halen model – the EVH90. While those are great pedals, I actually feel that the Blood Moon Phaser is a better choice because of the extra control it gives you. You can get far more out of an effect when you can tweak and change its parameters. That’s why the alternative I recommend here is the Helix Phaser by TC Electronic. It offers a lot more flexibility and control over the effect. You can use TonePrint to craft the perfect phaser and even experiment with setting different numbers of stages. Think of the Blood Moon Phaser as the budget option and the Helix as the full experience. If you want a simple phaser, go for the Blood Moon Phaser. If you want more control, go for the Helix Phaser. 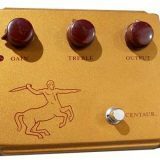 For more alternatives, check out my guide on the Best Phaser Pedals which gives suggestions on the top phaser pedals of different categories. If you want to learn more about phaser as well as all other types of common guitar effects, check out Guitar Gear Finder’s Guitar Effects Course here. The course digs deep into all common types of guitar effects and how to use them.